I took an unplanned walk at the river today. The kindness of strangers helped me carve out some time to enjoy my day and realize that I needed to stop and breathe and look up from all the tasks at hand to the beauty around me. And it was all around me. Details, details, details. It’s been a flurry of so many details these past few weeks. No matter how much I try to prepare for the start of school, it seems to come on like a wave of lists and things that need to get done. With three kids in college and 2 still in high school, there are some things that late August always brings. Add to that, that I teach, so there are lots of details there in preparing for my students in the classroom as well. This week, I’ve felt overwhelmed with details. Just the ordinary ones. And isn’t that when the extra-ordinary problems come? Car trouble…not just with one car, but with two. Family “discussions”. Unexpected expenses. Phone call from a friend whose doctor visit was so not good at all. All this in a matter of days. Days that are starting at 5:30 and ending at 12:30 or 1:00.And I’ve felt a bit spent and spread thin. I had a teaching workshop today, then worked at school for awhile. Around 5:00 I called my son to see if he could pick me up as we are needing to share cars this week. We went to the grocery store for the first time in a week. (For most families this might be normal, but when you have eight people to feed, the milk and basics are sure to be gone by that time, and they were!) So, I just didn’t have it in me to cook tonight and I bought two packs of rotisserie baked chicken, along with rolls, MILK, etc. Came home, and realized we must have left one of the chickens behind in the grocery cart or at the register. Right as I’m realizing that, my daughter called. It was one of those “Mom” phone calls that you can tell is not going to be fun. Her car had died. She was 30 minutes away. It wasn’t the battery and it wasn’t that she was out of gas. It wasn’t looking good.And I had so much to do in preparation for the next day. My days often feel planned out for me. Had so much to do, but it’s a no brainer in terms of priorities when things come up that require quick action. I made a cup of coffee (the new Dunkin Donuts “TURBO”! which I had purchased at the grocery store a half hour prior….just in time! ), and got in the car to drive the 30 minutes away. I left behind the dinner for the kids, got in the car with my turbo coffee, rolled the windows down, and turned up the music on the radio. When I got to the gas station where my daughter’s car had broken down, I saw my daughter and her friend by the car. There were three men working on the car: one underneath, and two hovering over the engine. “Mom, they’ve been here for so long! They’re some of the kindest people I’ve ever met even though I can’t understand what they’re saying!” All these words were spoken with the enthusiasm of my spunky 18 year old daughter. I will spare you more details, but the big thing is that the car was fixed by total strangers who worked on it for close to 2 hours. They would not let me pay them a dime. Not a dime. They fixed the starter on my daughter’s car (and actually went to the auto store to purchase the part.) We paid for the starter, but that was all. I got out cash from the ATM to give to them and they would not take any money. They didn’t speak much English, but they knew that they had made an impact. I felt encouraged in a way that I haven’t felt in a long time. It takes faith to be kind and not expect something in return. They did not look well off by any means and that money could have really helped them. I had assumed it would be a given that they took the money, and I was glad to pay it. But they wouldn’t. And the smile in their eyes showed me that they know who their Provider is. That’s faith. Giving without expectation. Being kind and compassionate and putting other needs ahead of your own…that’s sacrificial love lived out in the flesh. I got to witness that up close today. These three men will not be forgotten by me, or my daughter, or my daughter’s friend. Their impact ran deep. It’s amazing how a little thing can make such an impact. Matthew 10:42 says, “And if you give even a cup of cold water to one of the least of my followers, you will surely be rewarded.” I am praying that they be blessed and rewarded by the God who sees and knows and loves. I felt so very encouraged and it was not about the money. It was about the gift, the sacrifice. It was about people getting in there with us when we were in need. The purity of their motives encouraged us deeply. 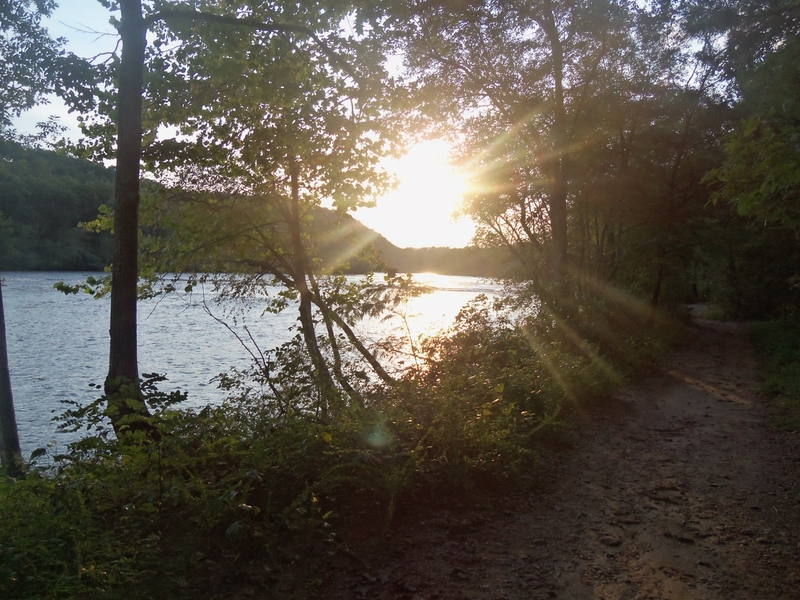 On the way home, instead of going straight home, I stopped by my favorite place, a river with a long trail along the water’s edge. I walked for an hour. I prayed. I took photos. I thanked God for the way He brings people into our lives. I breathed in and out and sang and smiled and thanked God for the reminder that everything that needs to get done will get done. I do not need to be tossed about in a flurry of activity. Giving up an hour to take a walk would have been the last thing that I envisioned doing on a day which required so many things to be crossed off of my list. But it was probably one of the most important things I did today. For when I take time to look around and enjoy the beauty around me, God has a way of making Himself known. When my eyes are always on the next task, it’s tough to keep perspective of why I’m checking things off the list in the first place. One more thought. I had a dear maternal grandmother. We called her “Grannie”. She was a woman with dignity and grace and was extremely generous and thoughtful. She was always sending her grandchildren surprises in the mail, even when her grandchildren had children of their own! I would receive care packages from her up until a year before she died. Whenever I thanked her, she would say, “Pass it on…” She shared with me that she had been given so much in her life from people that she would never be able to repay. But she could pass it on. She could choose to bless others around her without expecting anything in return. She blessed people in immeasurable ways. She blessed me, and I want to pass it on. I will most likely never be able to pay back the three kind strangers that fixed my daughters car. But I promise you, I will look for opportunities to help others feel genuinely cared for and surprised in the way that these met helped meet the need that my daughter had. I will pass it on, and I won’t forget the kindness of these strangers, and the impact they had on my perspective. The photo above was taken during walk on the river’s edge tonight. This post is beautiful in so many ways. I relate to many of the points that you made. Thank you for the important reminders about kindness, faith and life. I hope the school year kicks off successfully for you and your family. The photo you took on your walk is wonderful, too! Thanks so much. Their kindness so helped me “reboot” and get things in perspective! Thanks for the encouragement! Such a beautiful story, dear Heather, and such encouraging thoughts. Thank you for sharing! May God bless you as you prepare for school and diligently cover the details of daily life. I am so blessed to have read your words this morning. Much love to you in Christ.